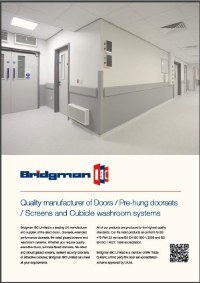 Bridgman has launched a new brochure designed to provide building professionals with a comprehensive overview of its product ranges. The brochure is designed to assist specification and features a simple range of options for doorsets. The specify simply choses the door core, select a door finish, chose a vision panel configuration, decides on 3 frame options and then picks an architrave profile.